Detail of Composition for the Blue Shoulders of Evening. 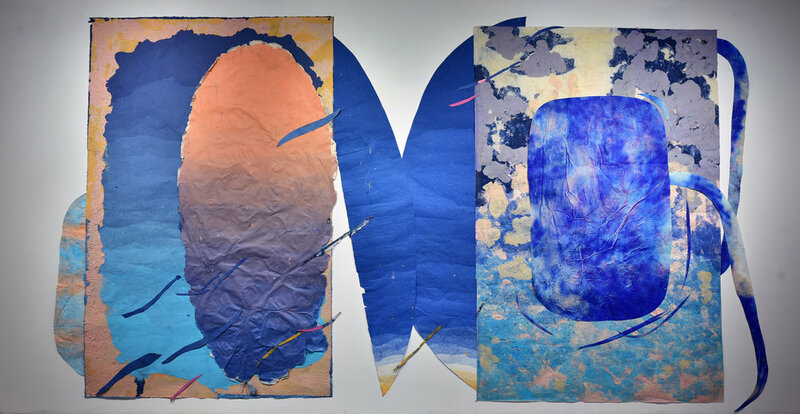 Composition for Morning’s Edge, 2015 - present, 144 x 252 inches, Kozo, sun, dust, pollen, hair, fiber-reactive dyes, repurposed paper, water. Detail of Composition for Morning’s Edge. 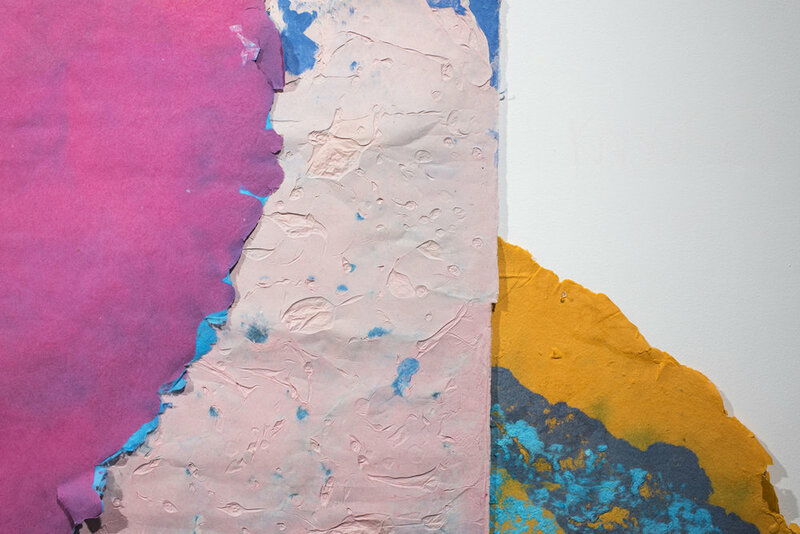 Composition for Two Lovers, 2015 - present, 144 x 183 inches, Kozo, sun, dust, pollen, hair, fiber-reactive dyes, repurposed paper, water. Detail of Composition for Two Lovers. 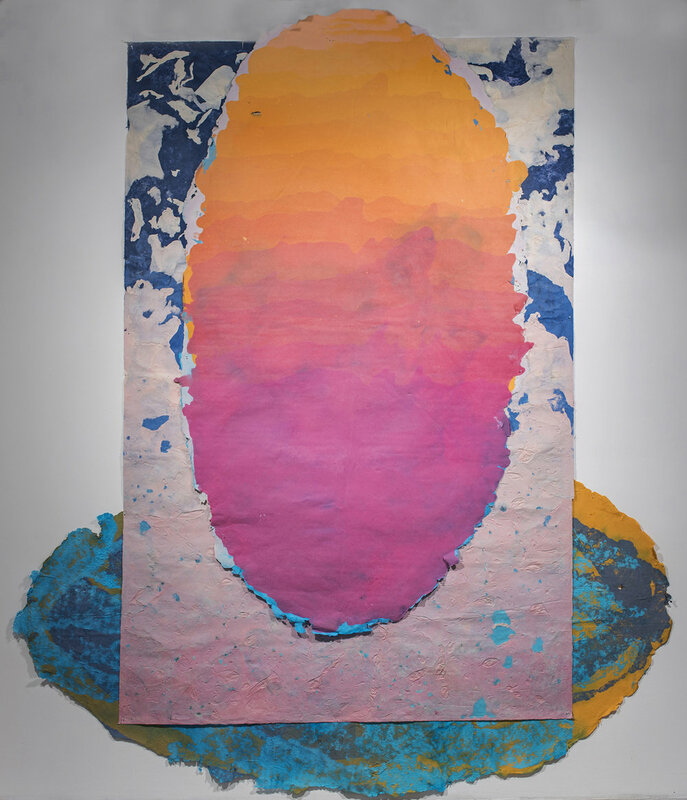 Composition for Holding the Whole, 2015 - present, 156 x 192 inches, Kozo, sun, dust, pollen, hair, fiber-reactive dyes, repurposed paper, water. Detail of Composition for Holding the Whole. Composition for the Inside of Stone, 2015 - present, 168 x 144 inches, Kozo, sun, dust, pollen, hair, fiber-reactive dyes, repurposed paper, water. Composition for Gravity in the Void, 2015 - present, 130 x 144 inches, Kozo, sun, dust, pollen, hair, fiber-reactive dyes, repurposed paper, water. Detail of Composition for Gravity in the Void. Composition for a Rose-Window, 2015 - present, 156 x 140 inches, Kozo, sun, dust, pollen, hair, fiber-reactive dyes, repurposed paper, water. 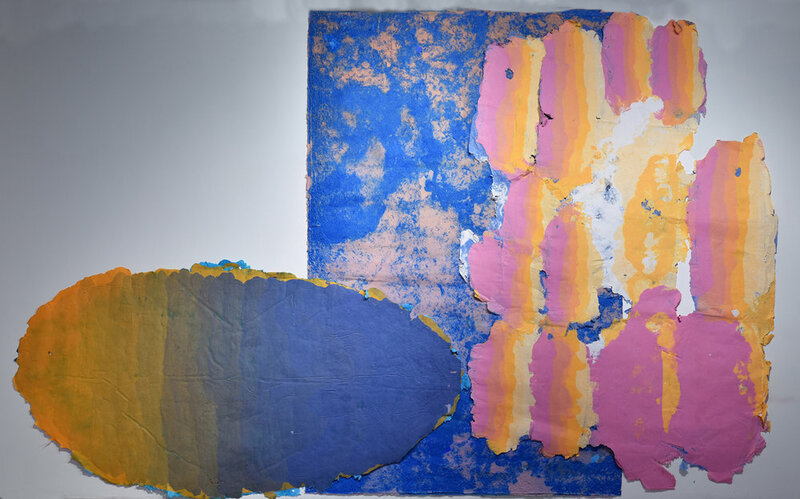 Composition for Walking Underwater, 2015 - present, 144 x 320 inches, Kozo, sun, dust, pollen, hair, fiber-reactive dyes, repurposed paper, water. Composition for Where Snow Falls, 2015 - present, 144 x 218 inches, Kozo, sun, dust, pollen, hair, fiber-reactive dyes, repurposed paper, water. Composition for a Comet’s Tail, 2015 - present, 180 x 156 inches, Kozo, sun, dust, pollen, hair, fiber-reactive dyes, repurposed paper, water. Detail of Composition for a Comet’s Tail. Composition for the End of Daylight, 2015 - present, 132 x 204 inches, Kozo, sun, dust, pollen, hair, fiber-reactive dyes, repurposed paper, water. Detail of Composition for the End of Daylight. Composition for the Invisible Pyramid, 2015 - present, 96 x 164 inches, Kozo, sun, dust, pollen, hair, fiber-reactive dyes, repurposed paper, water. Installation images of Dark Segment, an exhibition featuring a series of monumental, site-responsive paperworks created between 2015 and 2019.